How Safe Is Robotic Spinal Surgery? At one time, robotic surgery was nothing more than something out of a science fiction story. It then became something that was only available to select patients because there were only certain places where robotic techniques could be used to perform spinal surgery. Today, it’s becoming more accessible to patients in need of various procedures that either stabilize the spine or take pressure off sensitive nerves. But just how safe is robotic spinal surgery? 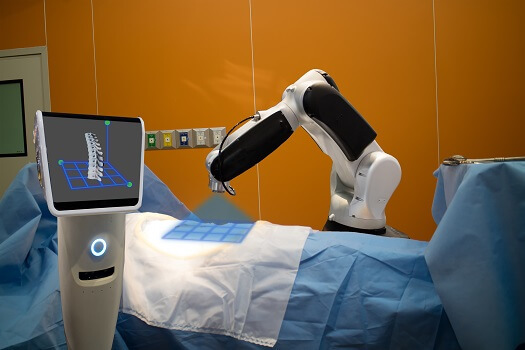 FDA-approved robotic spinal surgery is a type of minimally invasive spine surgery performed with miniaturized surgical instruments and small incisions. Examples of these procedures include spinal decompression, spinal fusion procedures, and spinal fusion alternatives. Santa Monica spine patients may be good candidates for robotic surgery, and more than 30,000 spine-related procedures have been performed with robotic guidance. Robotic surgery has also been used to place more than 100,000 implants, with 98 percent accuracy. In one study, robotic-guided spine surgeries were compared with fluoroscopic-guided (live X-ray) and freehand procedures. Surgeries performed with robotic technology had a 4 percent complication rate. The complication rate for live X-ray procedures was 5.4 percent, and the rate for freehand spine surgeries was nearly 13 percent. Another study found that screw placement was about 4 percent more accurate with robotic guidance. A larger study involving more than 3,000 implants found that robot-assisted placement was just over 98 percent accurate. The accuracy for hand-placed implants was approximately 91 percent. These results are significant because hardware placement that’s off by even a few millimeters could result in post-surgery pain and increase the risk of needing revision surgery. It’s important to note that robotic spinal surgery doesn’t mean robots take over and do the work. In fact, robotic devices don’t self-perform any actual part of the surgery. Instead, computer technology moves the machine used during the procedure to the precise location where hardware needs to be inserted. As is the case with any type of minimally invasive surgery, robotic spinal surgery isn’t ideal in every situation. Some patients still benefit more from traditional open surgery, while other individuals are better candidates for microscopic procedures. If robot-assisted surgery is recommended, take comfort in knowing it’s widely considered safe for most patients, although the general risks typically associated with any type of spine surgery still apply. Advanced techniques and state-of-the-art tools such as robotics allow today’s spine surgeons to perform procedures with greater accuracy and safety than ever before, and patients get the benefits of fewer complications and reduced recovery time. If you need to be evaluated for spinal surgery, make sure to consult with an experienced minimally invasive spine surgeon. Santa Monica residents can trust the spine surgery experts at The Spine Institute to give you all the information you need to prepare for your surgery and help you recover as safely and comfortably as possible. Call us today at 310-828-7757 to schedule a consultation.